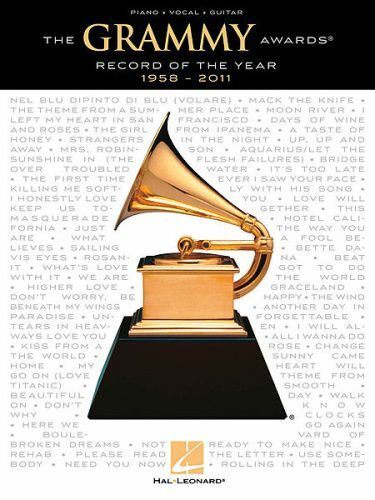 We proudly present this superb collection of the GRAMMY Awards® Song of the Year since its inception in 1958. 54 elite songs in all provide a snapshot of the changing times in popular music: All I Wanna Do · Beat It · Beautiful Day · Bridge over Troubled Water · Change the World · Don't Know Why · Don't Worry, Be Happy · The Girl from Ipanema · Graceland · Hotel California · I Will Always Love You · Just the Way You Are · Killing Me Softly with His Song · Mack the Knife · Mrs. Robinson · Moon River · My Heart Will Go On · Rehab · Rolling in the Deep · Sailing · Smooth · Tears in Heaven · Unforgettable · Up, Up and Away · Volare · What a Fool Believes · What's Love Got to Do with It · The Wind Beneath My Wings · and more. Features fantastic upfront photos and an introduction on the Recording Academy.